On May 14 2002, the Montreal-based videocard manufacturer, Matrox, officially announced its newest technology - the Parhelia GPU. In recent times, Matrox and video games technology have not exactly gone hand in hand so it was with a lot of anticipation that the information about the Parhelia was analysed. Given that the Millennium G400 came out in May of 1999, Matrox have been essentially upgrading the same basic GPU all the way up to the G550. After seeing the advanced features they touted for their G400 card, (hardware bump mapping, etc.) made quickly obsolete by a flood of products from Nvidia and ATI offering similar features and significantly faster 3D performance, Matrox apparently gave up on the gamers market. With the launch of the G550 chip, Matrox barely mentioned 3D performance in any of the hype for the new product, which may not have been a bad thing considering its performance remained strictly ‘adequate.’ Other features, such as excellent 2D image quality and the much discussed, apparently little used ‘Headcast’ feature got the press. On the other hand, Matrox does have an excellent reputation in the industry for two things in particular, exceptional 2D and 3D image quality, and most importantly, innovation. While competitors have been dominating the ‘enthusiasts’ video card market Matrox has been busy. The Parhelia looks like it may have the goods to knock nVidia's Geforce4 right off the performance throne! Despite the immediate lean to mispronounce the name Parhelia as 'Parriah', this chip is anything but an outcast. Using the current industry standard 0.15micron fabrication process, the 80 million transistor Parhelia GPU is going to be a large slab of silicon. It is considerably bigger than its nearest competitor, the Nvidia Geforce4 Ti GPU, which sits at 63 million transistors. As to why all this bulk is necessary, let’s look at the specifications for a couple of industry firsts. 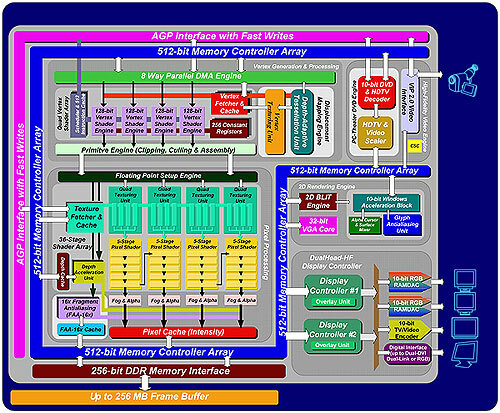 The Parhelia is the first ever 512 bit GPU, and this, combined with the (also) brand new 256 bit DDR memory bus will combine to give this new Graphics processor excellent bandwidth. Built on an eight-layer PCB to accommodate the complexity of the required routes, Matrox is claiming 20GB/s, almost double the memory bandwidth of the current Geforce 4 Titanium. This number is still up in the air as no specific GPU clock and memory timing information have been released yet. With the core running somewhere around 270-300 MHZ and the memory at 300-325MHZ DDR it would be right around 20BG/s; so consider these numbers as good ballpark figures. The Parhelia will have the capability of addressing up to 256MB of DDR RAM which is pretty astounding as well. 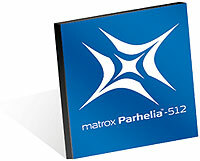 Matrox has specifically stated that the number one goal of the Parhelia GPU is image quality, not performance, but when discussing the Parhelia’s vertex and pixel shader arrays you have to wonder. It seems the whole assembly has been designed to one up the competition, even if just in terms of the numbers.